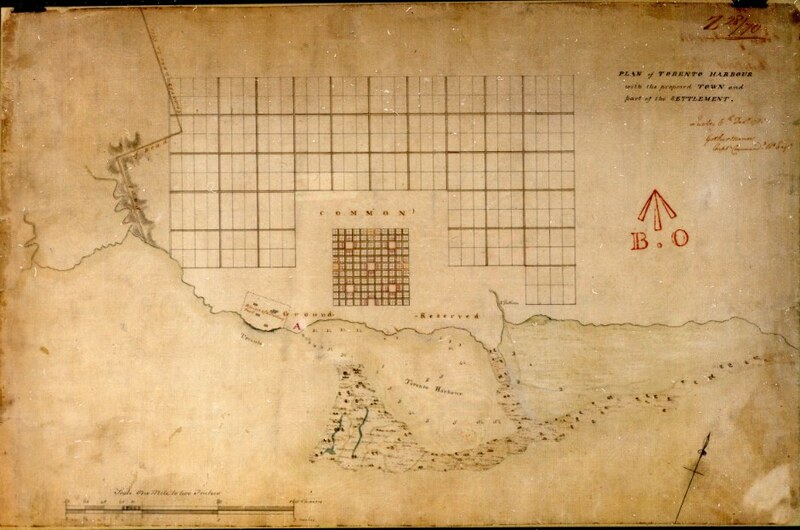 “This earliest detailed proposal for the town the British planned to build near the natural harbour was never laid out as it was too large and elaborate for a pioneer community. It was also applied to the site with little regard for its natural features. Ruins of a trading fort = the french Fort Rouillé, burned in 1759. “As can be seen in the illustration, the plan includes a central square containing military and government buildings surrounded by a common, which, in turn, is enclosed to the north, east and west by a residential area. The whole territory is bounded by the modern High Park, Broadview Avenue, and Bloor Street. The old Carrying Place [cf. 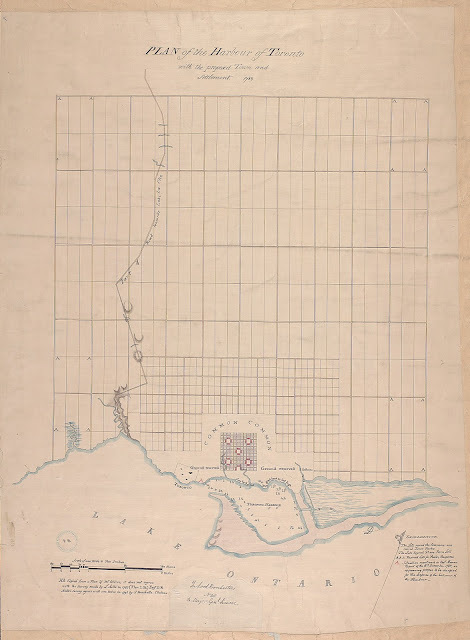 the Toronto Purchase map -N.] is there, but shown as a road leading to Lake la Clie, a misspelling of lac aux Claies, the name usually given to Lake Simcoe as the former ‘lac Toronto’ fell into disuse. “Gother Mann (1747-1830), a graduate of the Royal Military Academy, commanded the Royal Engineers in Canada from 1785 to 1791 and from 1794 to 1804. Returning to England, he later commanded the whole Corps of Engineers, and ended his career as a general and Inspector General of Fortifications.” - Ganton/Winearls, ibid. 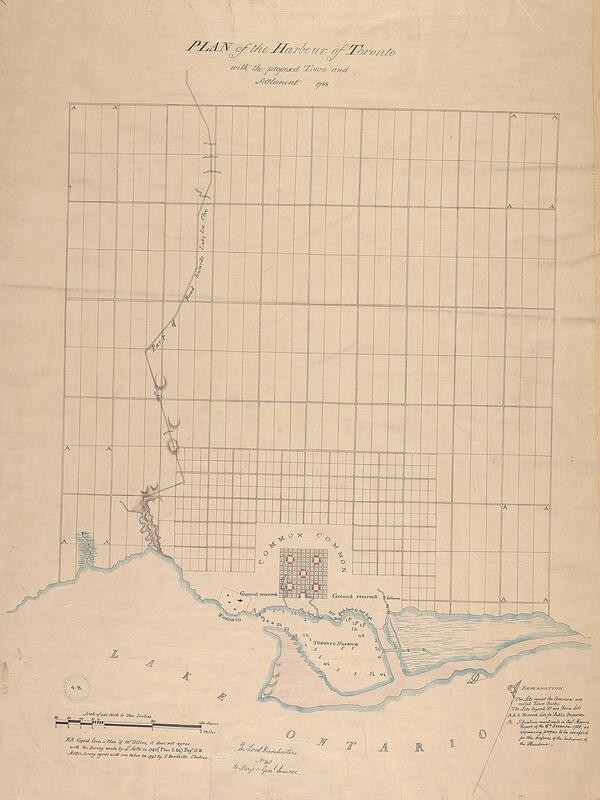 The top of the map corresponds roughly to where Finch Avenue now runs. 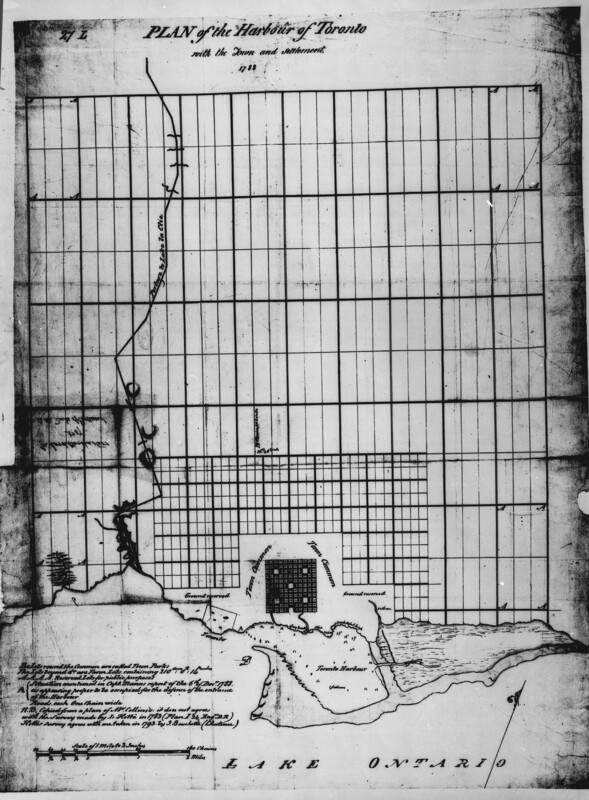 The map was used to demonstrate land that should be held in reserve where such reserves may probably be required for Public purposes. Image courtesy TPL: T1788/4Mlrg. See also LAC.